I've always loved baked beans, and for several years now I've made my own from scratch. 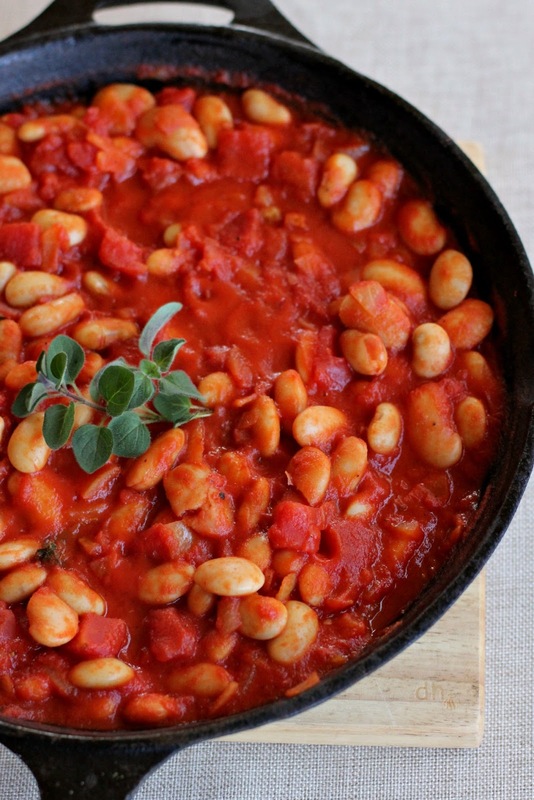 Aside form the nutritional virtues of homemade that tinned food just doesn't have, these homemade beans have much more flavour in them, and they're very quick and easy to throw together. I enjoy these in a variety of ways, but my favourite is to put the warm beans onto a piece of sourdough toast, sprinkle with freshly grated cheese and then cook under the grill until the cheese is bubbly and golden. Yum! Traditionally made with navy beans, for several years I used to make my baked beans with cannelloni beans. Now I prefer to use butter beans, as they are larger and also firmer, so they're not as easy to mush when stirring the pan. The fresh oregano adds a wonderful fragrance and depth of flavour, but use whatever fresh or dried herbs you have on hand. Serve hot or cold with an English style cooked breakfast, on a slice of thickly buttered sourdough or in a bowl by itself! I made it for dinner tonight ... delicious!! Yummy! Thank you for the recipe Sarah! I too am a fan of the baked bean and I have been eyeing off a slow cooker version that I imagine will bring that warm depth of flavour I adore about baked beans. I had a stand out breakfast of them at a cafe in Young when I was there earlier this year. It was Kettle and Grain Cafe.